We (OkayAfrica) sit down with the celebrated Malian singer to talk about her new album, Fenfo, as well as her hopes and fears about Africa's future. Seven years have passed since Fatoumata Diawara's internationally praised 2011 full-length debut, and in that time the Malian artist's solo career has absolutely flourished. She's almost always on the road, touring or writing or recording, collaborating live with legendary musicians like Herbie Hancock, Bobby Womack, and Flea. 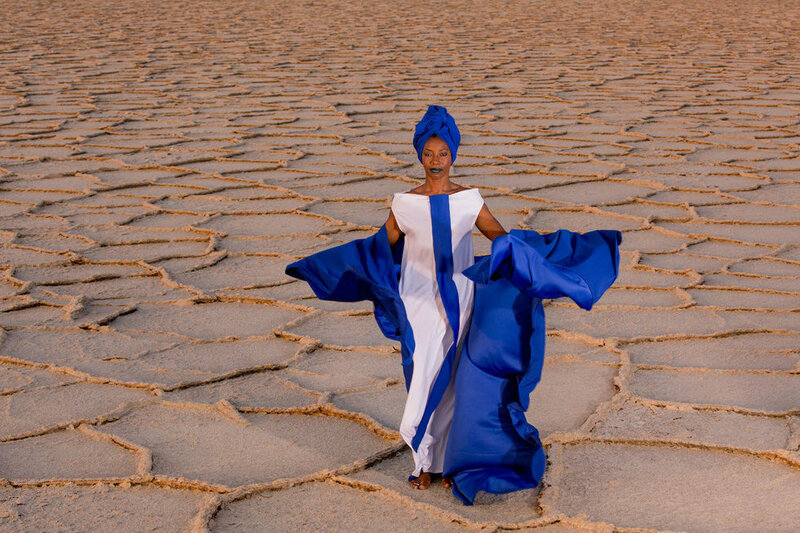 Those experiences informed her newly released second solo album, Fenfo, a brilliant step forward for Fatoumata's politically progressive, spiritually resilient Afropop. Fenfo was pieced together from sessions in Barcelona, Burkina Faso, Bamako, Paris and Minneapolis while on tour. The exhilarating, mystical energy of her renowned live performances gave life to these new songs, which unearth alternate visions of Fatoumata's breathtaking artistry not yet shared with the world. When I met with Fatoumata a few days before her headlining performance at Brooklyn Bowl for the World Music Institute's Festival of Mali, she was still glowing after a grueling day of press. It took just a few minutes for Fatou to warm up and lean in as she tells me about her life– habitually swooping beaded braids over the top of her head in a playful manner that lets me know she's comfortable. As we spoke an exuberant glimmer of hope remained in Fatou's eyes, even as she described the unfortunate circumstances that cripple and hinder her native Mali and the rest of Africa. The juxtaposition elicits echoes of Fatou's "Kanou Dan Yen" (or "Stop loving/Our love has no future"), an exceptionally beautiful song from the new record about two estranged lovers. The upbeat song reprimands the forces of tradition working against the advancement of society with simple, straightforward lyrics. A similar message resounds throughout Fenfo and our brief conversation. By the time I'm ready to leave she's embracing me, calling me her brother, relaying the feeling of love her music does so well to capture. It seems like you've been touring nonstop since your last record. Yes. Yes. Oo lalalala. Yes. It was full of different projects and collaborations that have been inspiring me for this second album. You can hear it on the second album, it's more open. Even the way I sing is not the same. It's because collaborations were like school to me. I've been working with some great artists, some very big, big artists. I can honestly say it was like school. Can you tell me about your relationship to Mali as your career has grown over the years? When I have time, the first thing that comes to my mind is to go back home. Eating with my mom, my father, my brothers. But at the same time, what I'm doing outside of Africa, I know that it has an impact on my generation. We are very connected through social media, Facebook, Twitter, all those things. I know that I should not stop fighting, because many young people from Mali in my generation tell me, you know, we have our eyes on you. So it's a big responsibility. I can't stop working. People need an example in Africa, because politicians can't be our example. They have a different aim, which cannot be my generation's aim. For us, I think we can find a way, how to save this Africa. But we should find our own way. I think it's starting already, what's happening in Nigeria, Ghana, Senegal, all of Africa. Even in Ethiopia. I did my last album in Ethiopia. It's made by an Ethiopian guy. He's my brother. These are the things we should be doing. We must be connected to make things happen, to introduce Africa in the best way. It shouldn't only be Mali or Ghana. No, we should open the door. I wanted to ask what inspired the choice to use Ethiopia as the location of your new music video, but you said it yourself. You're trying to break down borders and create more openness and unity. Unity. This will save us. It's like saying, I accept myself. Unity for me means, now I'm ready. Because when opening the door to your brother, you're really opening the door to yourself. But if you close the door to your brother, you're closing the door to yourself. How can you embrace unity if you are not completely full of love, full of your potential, if you don't love yourself? Love is the beginning of everything. We should love each other and be proud of who we are by acting and doing things, not talking or making some big speech. Just make it happen. It's my job. I'm African. It doesn't matter if I'm from Mali. This was the past. Our father did that. It didn't work. We should try something else. Opening the door. We should open it inside of us and we'll see that young people won't go to Europe or leave Africa, that we'll stay home and make things happen there. We've got a lot to do. We don't need to run. Don't run from yourself. That's why I went back to Mali. I'm living in Bamako to set the example. When I'm there, young people come to my house and we talk and share and they follow me. I have a big responsibility. I read that you recently became a mother. That's why I have a song on the album that's called "Mama," because for the first time I'm in the middle. I've got parents and I have my son. I have my job. And I should take care of all of us, all of those emotions and feelings and keep fighting for myself as a woman, which is not easy. I didn't grow up with my parents, so I didn't say "Mom" in my life. When I was a child I would call my mom by her name. So when I say "mama" on stage, it means a lot to me. It means a lot. For this song, I was ready to say mom, to sing "mama." It's one of the best words. Do you think you'll encourage your son to play music? I will let him decide, because music is quite tough. It seems easy, but it's not that easy. Music needs attention. It needs love, a lot of love. It needs passion, like everything. and if at the same time you want to be the voice of a new generation in Africa, it's a big responsibility. Don't sing just to sing. Sing to change things, to make things better. This is my decision. That's why I can't have a song every four months or once a year, like many people do. I can't do that, because I know many people will be listening to my lyrics. Especially in Mali, because I'm singing in Bambara. Many, many children like my music. I don't know why. Maybe because the melodies, but I need to write for them. I'm making their education. I'm taking a position of mom, being a mom for them. I can't write a new single every six months. If you're going this way, you can't say music is easy. It's a big responsibility. So if my son is ready to do this, yeah I will respect him. A lot. I was first introduced to you and your music through the film Timbuktu. Have you been working on new any film projects lately? Three weeks ago I was in Senegal for a new movie with Omar Sy. He's a famous artist and actor from France. We were in Dakar. They're still there working, but I was supposed to go on tour. I'm still making movies, every two years or so. I do like acting. But music is more me. It's my hope, my love for my continent. It's my communication with my generation. It's my conversation with the next generation. It's sharing myself, exposing myself. I'm exposing myself to change people's lives. Your recorded material continues the lineage of folk and blues rock that's historically famous in Mali, but you also seem to be adapting to new trends in pop like electronic music. I'm scared for Africa. Especially for Mali, where everything is through instruments. Every region has its own instrument and every instrument speaks a language. You put Toumani [Diabaté], Ali Farka [Touré], Oumou Sangaré, Amadou and Mariam, Tinariwen and me on the same festival, you will hear different songs and different regions. It's because of our instrument, the way we play the instrument, it speaks a language and brings a different part of the blues. It's like the same mom but different children. When I see how things are going with a computer where you can make a song in one day... Sometimes I think we should sit down and talk about it. It's good for some to do that, and it's also good for some people to play instruments. I've been putting a little bit of electronic stuff in my new record. But not that much. Onstage, it's more about rock or blues solos. I'm playing guitar onstage and this is to stay we should keep playing an instrument. 'Fenfo (Something To Say)' is out now.